Trim the white construction paper to fit around the cardboard tube. Use a glue stick to cover the cardboard tube with white construction paper. Using the pattern provided cut out paws from white construction paper and color in the paw pads with a black marker. Color in the nose pattern with black marker and glue it to the cardboard tube. Use a pink crayon to add rosy cheeks. Glue the googly eyes to the bear and use a marker to add a smile and eyebrows. You can use ordinary white copy/printer paper for this instead of construction paper. Construction paper is thicker and not as translucent, so it will cover the dark cardboard tube better. 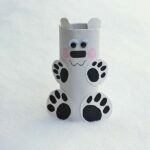 This project for Cardboard Tube Polar Bear was printed from CraftsbyAmanda.com - https://craftsbyamanda.com/cardboard-tube-polar-bear/ and can only be printed for education or personal use.